Mei Han and Red Chamber, Library and Archives Canada presented by National Arts Centre "BC SCENE"
Mei Han & Randy Raine-Reusch - Colingwood Music Festival Ontario. 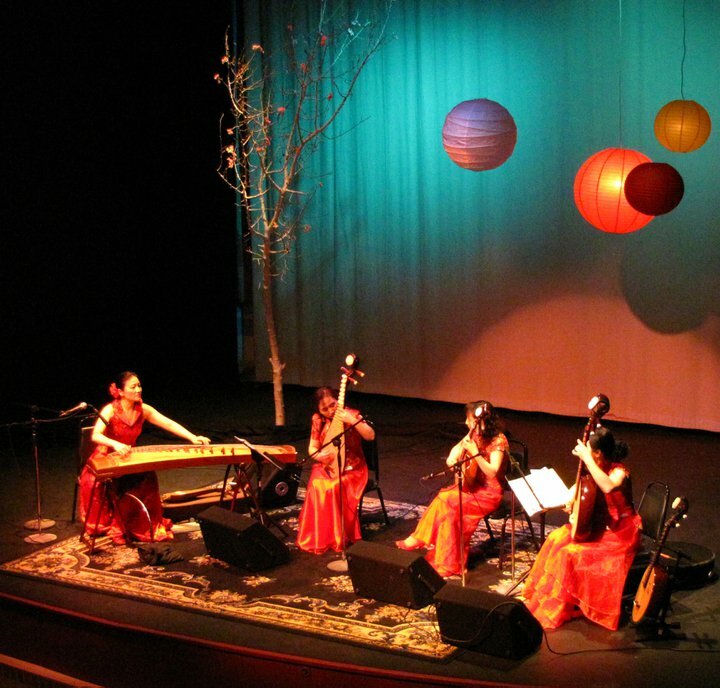 Mei Han - CD Release Outside the Wall - New Directions for Chinese Zheng, A mix of groundbreaking contemporary works and traditional musical treasures for the zheng. Mei Han propels this elegantly beautiful ancient instrument firmly into the 21st Century. Includes works by John Oliver, Minoru Miki, Randy Raine-Reusch and Barry Truax. Mei Han - MusicWorks Article - Mei Han, specialist on the Chinese Zheng, broadens the scope of traditional, composed and improvised music for her instrument. 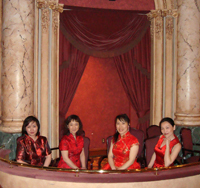 Mei Han - Open Ears Festival - World Premiere of Janet Danielson's Enchanted Glass with harpsichordist Cynthia Herbert. Mei Han - World Premiere of Still Turning -John Oliver's new work for zheng and guitar. Mei Han & Randy Raine-Reusch - World Premiere of Raine-Reusch's The Legs of a Crane,with Issui Minegishi, the Hereditary Grand Master of Seikyodo Ichigenkin, and Ichiyo Saito, the head teacher of Seikyodo,, Further East Further West Festival Vancouver, sponsored by the Japan Canada Fund. Mei Han & Randy Raine-Reusch - Tanz and FolkFest Rudolstadt, Germany - Solo concerts as well as performances as part of the Magic Zither project with Abdullah Chhadeh (SYR) on kanoun, Andrew Cronshaw (GBR) on harp-zither, Michal Muller (CZE) on concert zither, Pati and Jean (MDG) on valiha and guitar, Antal Racz and Anne-Marie (HUN) on citera and gardon, Timo Vaananen (FIN) on kantele, Iba (PLE) on percussion, and Bernard O'Neil (IRL) bass. The project was led by Wolfgang Meyering. Mei Han - Premiere of John Sharpley's "When Cranes Fly Home", the first original concerto for zheng and orchestra, with the China Philharmonic Orchestra at the Bao Li Theatre, Beijing. Mei Han & Randy Raine-Reusch - Concert Tour to Japan, China, Singapore and Australia, including WOMADelaide in Australia. Mei Han & Randy Raine-Reusch - Canadian Summer Tour, including: Sunfest, Ottawa Blues Festival. Montreal Botanical Garden, Vancouver Folk Music Festival, and Atlantic Jazz Festival. Mei Han & Randy Raine-Reusch - Eastern US and Canada Tour including: Wesleyan University, Kent State University, University of Guelph, and University of Waterloo. Mei Han - Vancouver New Music Festival 2002, solo concert. Premiered Tribute to Ling-Lingfor solo zheng by Lee Pui-Ming, commissioned for Han by Vancouver New Music through the Canada Council for the Arts. 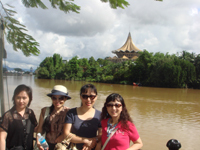 Mei Han - Sound Travels Global Internet Exchange with Paul Plimley, Vancouver; Akikazu Nakamura, Tokyo; Ellery Eskelin, New York; Jason Robinson, San Diego; Robin Fox & Anthony Pateras, Melbourne; Lê Quan Ninh, Toulouse; Mia Zabelka, Vienna. Real time transglobal interactive concert. Mei Han & Randy Raine-Reusch - Distant Wind, the premiere CD by Mei Han and Randy Raine-Reusch was nominated for a JUNO under the "Best Global" category, and two West Coast Music Awards under the "Best World Music" and "Best Instrumental" categories. 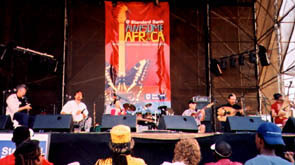 Mei Han & ASZA - Awesome Africa Festival in Durban, South Africa. Check out Afribeat.com for more info. Mei Han - Research in contemporary koto with Kazue Sawai, Tokyo, Japan. Mei Han & Randy Raine-Reusch - Vancouver International Jazz Festival. 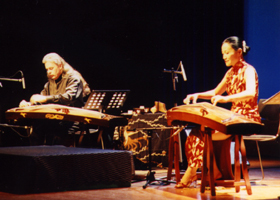 Mei Han & Randy Raine-Reusch - Concerts in Singapore. 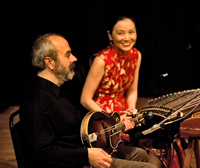 Mei Han & Randy Raine-Reusch - Concert at Chime Conference on Chinese Music in Prague.